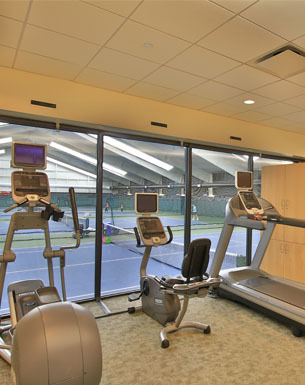 In addition to eight indoor courts, the Racquet Club of Lake Bluff also features fitness areas with free weights, strength equipment, cardio machines (with Cardio Theater TV’s) and a workout studio with other options. Enjoy our strength training selection of barbell weights, dumbbells and resistance machines. Rev your heart rate for increased endurance and muscle tone on our treadmill, recumbent bike, and elliptical machine. The training studio includes stability balls, foam rollers, speed ladders and more. Our club features the amenities you need to keep your body in shape, your muscles limber, and your mind sharp for top-level tennis all year round. Access to the fitness areas is one of the many benefits of membership (for members who are age 16 and older) at RCLB. Whether you’re on the court or in the fitness studio, you can get moving, get healthy, and enjoy the sport in any season. With certified professionals and top-tier programs and facilities, the Racquet Club of Lake Bluff is dedicated to advancing the game of tennis for both adults and children. Serving up the North Shore’s finest tennis for nearly 50 years, RCLB combines American and French teaching techniques to ensure that players receive well-rounded tennis development. Instructional programs at The Racquet Club of Lake Bluff offer both aspiring and experienced players alike the opportunity to learn fundamentals, key strategies, and practice, practice, practice! With a facility that features amenities for instruction, drills, camps, tournament play, and special events, The Racquet Club of Lake Bluff offers programs for every age and level of tennis experience. The Racquet Club of Lake Bluff has been serving up the North Shore’s finest tennis for nearly 50 years. The club is home to hundreds of tennis players that participate in a wide variety of activities including instructional programs, team tennis and social events. We offer tennis opportunities for players at every level—adult tennis, junior development, travel teams, youth tennis and more.